I know I know. Broccoli is good for you. Enough already. Me Plus Broccoli are just so-so friends. Not even "acquaintances" really. She shows up at my house twice a week, without fail. But I don't like her. I eat Broccoli because it's good for you. Not because I like it. I make it the same way, EVERY TIME. Twice a week, I make broccoli the same way. BORING I tell ya. Below is exactly how I make it. In this boring metal steamer. 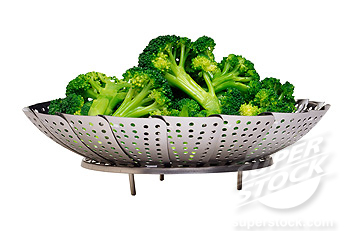 Well, this whole "steaming of the broccoli" is about to change! I can't stress enough to you how much I loved my broccoli last night! Never in my wildest dreams would I say Love & Broccoli in the same sentence. 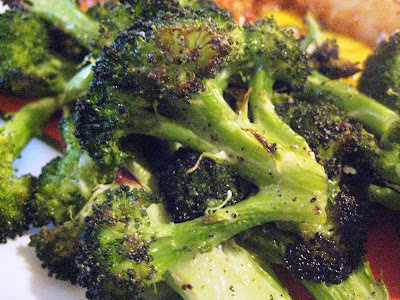 Last night I Roasted my Broccoli with Olive Oil, Garlic, Lemon and Parmesan! Just like Ina Gartner told me to. Oh it's so easy and oh my goodness....why have I not been doing this all these years? I think Broccoli and I have become very very good friends! Preheat oven to 425 degrees. (The key to roasting vegetables is to make sure the oven is hot, 425 is perfect). This is where one of those quarter sheet pans comes in handy. As I mentioned in my Pumpkin Bar recipe, I love these pans. Some people call them Jelly Roll pans. Cut your head of broccoli into nice florets. Don't make them too small. Toss all the florets with Olive Oil. Be generous, don't skimp. Place them on the sheet pan. Throw in the sliced garlic and sprinkle with Kosher salt and black pepper. Roast in 425 degree oven for 20 to 25 minutes. Until it just starts to get a little bit brown. Take out of oven, and grate lemon zest over florets. Squeeze the juice from 1/2 lemon over all. Hello Broccoli.......Where have you been all my life? Mmm, broccoli is one of my favourite vegetables! I'm definitely going to be trying this recipe, it sounds divine! How can I do this with frozen broccoli? So preheat to 425 then cook at 400? Is that right? Just made this tonight. 25 minutes was too long. It burnt the broccoli a little too much. Just a heads up to really watch the broccoli when cooking! This is also very delicious with asparagus!! !